The Alvin Synchro-Tilt Painter’s Stool is designed for maximum comfort and functionality. 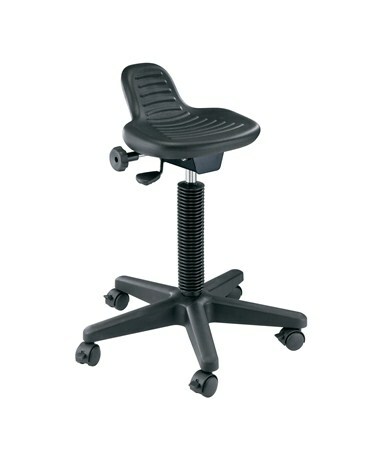 It features a 13"W x 9"L x 4"H soft Polyurethane seat that comes with a lower back support. To provide the best height and angle for any work, it is equipped with a synchro-tilt mechanism that allows tilt adjustment of six degrees forward and seven degrees backward. Its height can be adjusted from 21 inches through 30 inches. Both height and tilt can be easily changed while seating. This painter’s stool is ideal to use while working on large easels, drafting tables, and even office desks. It guarantees stability with a reinforced nylon base that is 24 inches in diameter. It offers versatility in terms of mobility with a complete set of locking casters and a set of non-slip floor glides that are both included in this package. The Alvin Synchro-Tilt Painter’s Stool comes in black color.